The mission of the Skirball Cultural Center is to celebrate and cultivate the links between American democratic values and the Jewish heritage. Through our museum exhibitions and public programming, the Center strives to deepen the understanding of the origins of American families and their role in strengthening American society. Currently the Center is redesigning its web site to transform it from an electronic brochure to a more content-driven site. One feature being developed relates to family histories and the immigrant experience. To more fully portray the immigrant experience and to illustrate the relationships between different communities, we are collaborating with other cultural institutions to create a virtual "Rashomon" - to tell similar narratives but from different voices. The method we are developing involves creating contextual hyper-links within a non-linear narrative that connects a partner institutions� web site. Hyper-links generally follow a linear model where a user enters a particular site, selects a link to navigate within or to another web portal. We are creating links with partner institutions� sites that occur within the context of the actual narrative. On our site for example, we tell the story of a Russian Jewish family that immigrated to Los Angeles in the 1920's and had neighbors who were Japanese immigrants. The Japanese American National Museum web site tells the story of this Japanese family. Within the narratives on the different sites, there are anecdotes and stories about the interactions and relationships between the families. These interactions provide the context for direct links between the individual family stories that reside on the various partner web sites. There are several goals for our virtual "Rashomon" project, including celebrating positive attributes of the immigrant experience, promoting collaborations between institutions and communities, developing technology that will access and create on-the-fly content and utilizing the computer as a creative tool in the storytelling and the narrative process. Imagine this, you are sitting with your family at the kitchen table after a big meal and discussing the family history and legends. Grandfather, an immigrant, is entertaining everyone with stories about his experiences as a greenhorn in this country where the streets were supposed to be paved with gold, but in reality, people were lucky if they were paved at all. At one point he says: "Remember that other family who lived across the street from us? They were from another country from us, but my, how we had fun with them at their holiday picnics. I wonder what happened to them?" And then, at that moment, you find yourself magically transported (or beamed) over to the kitchen table of that family, where they are discussing their family�s stories and how much they enjoyed celebrating a holiday with your grandfather. What you have just experienced is an example of a contextual link in a non-linear narrative. Although it is impossible to experience this in real life/space, with research, thought and planning you can make these excursions in the digital world. But before we make these journeys, we must first define the concepts of non-linear narrative and define contextual links. In some ways, the concept is easier than the answer. The short description is that it is a method of telling multiple viewpoints of a story across multiple web sites with multiple entrance portals. Non-linear narrative is not really a new idea, so it would be interesting to take a brief, subjective overview of its history along with examples of how it appears in different media. The first example of non-linear narrative is text based: the Talmud, the Jewish books of law and commentaries. The Talmud as a physical entity is a set of 63 volumes originally compiled around 500 C.E. in Babylonia to preserve generations of analysis and discussion by rabbis and scholars. It contains extra-legal and anecdotal material relating to all aspects of life- such as dietary laws, marriage, divorce, religious ritual and agricultural laws. Although at first glance the books seem similar to an encyclopedia, they are far more complex. 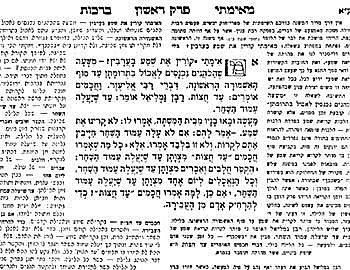 The breadth and organization of Talmud is similar to random-access type memory organization of the web. One of the reasons for this is that the Talmud contains one of the primary functions of non-linear narrative � hypertext (a term invented by Ted Nelson, a few short centuries after the Talmud was compiled). The physical structure of a page of Talmud (Figure 1) facilitates a non-linear process. It consists of a main text block in the center of the page surrounded by several smaller text block in different font styles and sizes. Detail of the first Page of volume one, "Benedictions" of the Steinsaltz Edition of the Babylonian Talmud. The main text is located in the center of the page and usually addresses a particular problem, dilemma or question in the form of a story. Surrounding this block are comments by different scholars and rabbis also written in the form of stories, and comments that address the main text unit. Additionally, these side comments often refer to text blocks and commentaries located in other volumes of Talmud. A person studying Talmud does not simply pick up a particular volume and read. It is necessary to jump from point to point, page to page and often volume to volume to understand any one section. Several centuries after Talmud was compiled, the printing press was developed. After some fits and starts pertaining to the use of this new machine, a form of narrative story was developed called the novel. Early forms of novels were presented in a linear manner. In her wonderful book Hamlet on the Holodeck, Janet Murray describes an early exploration of non-linear form. She uses the example from the 18th century novel Tristram Shandy written by Laurence Stern in which the narrator: "�inserts black pages, numbering chapters as if they have been re-arranged, claims to have torn out certain pages and sends us back to reread certain chapters. In short, he does everything he can to remind us of the physical form of the book that we are reading". Although Stern came up with some very interesting literary devices, the basic format of the book still remains rooted in linear methodology. The reader turns page after page. This century also has its forms of non-linear media, a recent example being the interactive-audience-participatory-theater-experience. About 10 years ago I saw (or more realistically, participated in) a play called Tamara. The play was performed in a large veteran�s hall in Hollywood that had been an old mansion and was furnished in a 1930�s art deco manner. Upon entering the "theater" I was handed a ticket designed as a passport and led into a large foyer cocktail party where the servers were all members of the cast. The theme of the play was about a group of actors, fascists, and anti-fascists, gathered in a mansion in pre-WWII Italy. At a certain point, the cocktail party ended and the play began as the actors shifted from servers into their roles. We the audience ("party guests") were divided into groups and began to follow cast members around the mansion, up and down staircases, through passages and in and out of rooms as they interacted with other cast members, acting out separate, but connected plots. Although the audience was encouraged to stay with one or two particular characters, we could shift to other groups of actors if one particular story line looked more interesting. The timing of the actors was amazing! Because of the complexity of the story, it was virtually impossible to understand the complete story, so each member of the audience was presented with just one small view. Intermission was in the dining hall, and as we ate, we all exchanged information to get a better picture of what was happening. Multiple attendance of the play was encouraged by reduced ticket prices for each subsequent viewing. I think the fourth or fifth visit was free. Although it was at times a bit unbalancing trying to figure out what was happening, it was a fascinating, entertaining and fun experience to participate in breaking the boundaries of the medium. The development of cinema has also increased the exploration of non-linear narrative. Popular movies such as Back to the Future, Groundhog Day, and the more obscure Head (the 1968 movie by the Monkees), or the German film Zentropa play with our sense of time and place. The audience is not a passive observer, but must become an active participant to assemble the various plot threads of narrative to a coherent story. In Hamlet on the Holodeck, Murray writes about two significant terms necessary in the discussion of non-linear narrative �"multiform stories" and "active audience". She defines "multiform stories" as "�written or dramatic narrative that presents a single plot line in multiple versions�" and "active audience" as the result of a "�writer expands the story to include multiple possibilities, the reader assumes a more active role". Kurosawa�s cinematic masterpiece Rashomon is a wonderful example of multiform stories" to promote an "active audience". The story revolves around a large gate in the middle of a forest in which two peasants are discussing an incident involving a samurai, his wife and a bandit. Something took place in which the samurai was killed, the bandit was arrested and the wife may or may not have been raped. The story is told through multiple voices (including the dead samurai as channeled by a medium!). The audience cannot sit by and idly watch the film. It is necessary to pay close attention to detail to attempt to discern the true facts. Because there is no concrete resolution at the end of the film, the audience is left in a rather ambiguous position. The beauty of this is that each member of the audience must come to his or her own conclusion that satisfies his or her individual interpretation of the events presented. As much as these books, films and theater explore non-linear narrative, utilizing devices such as the cinematic flashback, they are limited by the individual strengths and weaknesses of their particular media and can only be presented in a linear fashion (page-after-page, scene-after-scene). There is though, one distinct idea that connects all of the examples. In one manner or another they are all procedural experiences. Although the conclusions may be gratifying, what makes these examples compelling and interesting is their dynamic nature. They are all about how you arrive rather then actually arriving. In their on-line manual, The Digital Cookbook, Joe Lambert and Nina Mullen describe this form of story telling as "the journey". While other forms of stories use the traditional literary devices to set a premise, then to create tension as characters move along a path to achieve specific goals (get the guy/girl, solve the crime and find the culprit, slay the dragon, etc. ), the goal of the journey is the journey. The experiences and lessons learned are the central forces behind the journey. In some ways, whether the hero/heroine achieves his/her goal is secondary to the route that they pass through. This form of story telling can be unfulfilling because of the lack of any concrete resolution, although this is really not the case in the previously mentioned media (except for Talmud). Conversely, the journey story can also be a compelling, exciting and even addictive experience. The movie serials in the early days of cinema, or the soap operas of today command huge audiences because of the fact that there are no real conclusions. Characters come and go, adventures happen day after day and the audience is continually drawn back to part of the process. At this point, the age of computer and World Wide Web enter the picture. From the campfire, to stages, pages and silver screen, storytelling has always reflected the primary media of a specific time period, and the computer age is no different. Currently, we are in the infant stages of investigating the results of the intersection of form (digital content) and function (technology). There are several specific elements that differentiate the medium of computers and Internet from earlier media. The most important one is that this particular media is incredibly dynamic both in terms of the development of technology and how it is used. It is interesting to note that movies and books have an audience but the world wide web and CD-ROMS have users and that these users are active participants in choosing their own paths and journeys (much like real life). This could lead non-linear stories to be rather chaotic experiences. Ultimately, stories require a basic framework and structure to be satisfying and compelling. A story properly planned and executed will allow a user to travel along a dynamic path of a general topic for exploration and adventure. Imagine being able to enter a story and choose which character you wish to be the narrator, and then being able to choose another character to experience the same adventure from a different viewpoint, or to choose different characters� paths and journeys to the same incident or location. The two technical elements that allow for this kind of interaction are 1) the recognition that the computer is an engine; and 2) the relational database. Simply put, every computer on this planet can hold multiple databases. The computer, as an active engine, can theoretically access these databases and publish real time web pages that display discrete quantities of relevant content. Exploring family stories is not new to the web, with many interesting examples. One interesting example site is My History is America�s History, a project of the NEH. This educational program teaches people methods of gathering family stories and then encourages them to post their favorite family stories on the web. Another is Abbe Don�s wonderful site called Bubbe�s Back Porch. This site has an area for a digital story bee along with requests for submissions of individuals family stories and photos. Both of these examples require active participation- gathering and posting information along with surfing the site. Ultimately though, they are presented in a linear web format. A visitor enters the site, explores one or more particular stories within the site and then exits. Our project is tentatively called, Grandfather�s Virtual Kitchen because people tend to congregate in the family kitchen and that is where some of the best stories are told. We want to tell the stories of immigrant families and the relationships that existed within different communities. Although immigrant groups have naturally tended to reside together in neighborhoods, there has been one unifying force among the different communities- they are all "strangers in a strange land". It would be false to say that there were no problems- there are plenty of examples of the conflicts, stress and tensions that existed (and still exist) between various communities. This is not the purpose of Grandfather�s Virtual Kitchen Our purpose is to portray the stories of immigrant families and how, over time, positive relationships between different groups have developed. It is far more interesting and relevant for us to illustrate examples of how communities can co-exist with tolerance and mutual respect. A sentence found in our mission statement sets the tone for Grandfather�s Virtual Kitchen: "Just as the American immigrant experience is different for each group and individual arriving on these shores, the Skirball Cultural Center provides an unrivaled rainbow of programs and opportunities to enrich each visitor." This idea is manifested both in the core collection of the museum component of the Skirball Center, which focuses on Jewish history (especially the American Jewish experience) and with our various other programs, including musicians, speakers, theater, dance (and more) that highlight and celebrate cultures and communities from around the globe. Additionally, our education department has been involved in some creative community projects such as Finding Family Stories. This project was developed by the Japanese American National Museum and was a collaboration with the Santa Barbara Museum of Natural History, the Korean American Museum, Plaza de la Raza and the Watts Towers Arts center. The goal of Finding Family Stories was "grounded in the belief that cultural institutions, representing different ethnic communities, could learn from one another- both organizationally and culturally- through the process of developing, implementing and working on a project together". With a basic understanding that no community or cultural institution operates in isolation, these five institutions created a model that "would not only reflect a single cultural experience, but expand and open the doors to the experience of others as well". The main activities of Finding Family Stories were a series of collaborative workshops at partner institutions over a three-year period, culminating in concurrent exhibitions at partner institutions that highlighted "contemporary artists of each community who incorporated and interpreted family stories within their work." Grandfather's Virtual Kitchen expands on the themes developed in Finding Family Histories and begins to apply a non-linear narrative and contextual links theory to practical applications. By using the Internet as the medium and the web as the delivery platform, site visitors become active participants in exploring the family stories and community interactions, rather than simply being observers. As visitors to a particular site explore the stories, photographs, video and sound clips of an individual family representing a particular community, they will discover anecdotes about interactions with families of other communities. These anecdotes provide the links to the other families stories that are located at the partner institutions� web sites. The collaborative process needed in producing this project � to find partner institutions, develop content, technology and links results in a process that is concurrent with the goal- collaboration between communities. As with any other interactive project, the process of creating Grandfather�s Virtual Kitchen is as non-linear as the end product. Each issue, question and decision uncovers a new series of issues and questions requiring a new series of decisions (a can of virtual worms). The problem of the chicken-or-egg syndrome then arises: what comes first? The answer to this question is: the question. The answer to the question of what comes first in creating a non-linear narrative is also relatively simple- it�s the idea. In our specific case, it is the creation of a virtual space that allows visitors to actively explore discreet family stories along with the interactions and relationships between members of different communities. The decisions and production process that follow this simple idea are not quite so simple. It is necessary to first identify and enlist partner institutions, followed by determining production teams and the infrastructure. With a core team together it is possible to begin to define the scope of the project. With this done, the actual production process begins. Part of the beauty of the dynamic nature of the web is that a project such as this can be developed incrementally, initially involving three or four partner institutions, expanding as the narrative and are developed. Collaboration is the order of the day, so it is important to identify institutions and individuals that share common goals and interests. It is not necessary for an institution to confine itself to one particular niche. For example, although the Skirball is a cultural center and museum, we do not need to limit our partners only to other cultural museums. With a bit of imagination and creative thinking, it is possible to expand collaborations to other types of institutions. For example, if a member of our digital family is a scientist, we can create a partnership with a science center/museum whose site has an area that celebrates this individual's contribution to the scientific community. Nor is it necessary to be confined to a single geographic area. Links can be created with institutions across the country and world to show the journeys of individual families. One possible scenario for us is to begin our story with our virtual grandfather�s arrival to America with a site/link to Ellis Island. Then, via links with museums and cultural centers across America, we follow his path to Los Angeles. As previously discussed, there are many issues that need to be examined when producing an interactive project. Here are several examples of questions that we have encountered and how they have currently been resolved. First, creating Grandfather�s Virtual Kitchen is basically a three-part process: 1) research; 2) gather content and media; and 3) production. The first step of Part I is one of the most crucial elements of the process. The partners decide between two styles of story telling- the composite story or exclusively true story. True stories are the most compelling, but research can be difficult and cost prohibitive. For our prototype, we have decided to develop stories closer to a model of historical fiction, taking stories from selected primary sources and weaving them together to create a narrative that matches our goal. For example, our virtual grandfather is a Russian Jewish immigrant whom we shall call "Ben". Ben had a dairy route with a horse and wagon. One of his customers was a Japanese immigrant family whom we shall call the "Kurosawas" and who owned a nursery. During World War II, the Kurosawas had to leave their nursery when they were sent to an internment camp in the California desert. The streets may not have been paved of gold, but Ben�s heart was. He watched over the nursery and returned the keys to the Kurosawas when they returned home after the war. The events of this story are true, but the composite is artificial. We have examples of righteous people who assisted Japanese Americans during the war. We have the story of a Jewish immigrant family who had a dairy wagon, Japanese customers and a strong sense of ethics and justice. And we know about a Japanese American family who owned a nursery, were sent to an internment camp and had a neighbor who watched over their nursery while they were interred. What is lacking is the direct link between these specific families. By creating a composite of multiple family stories, based on true events we can illustrate how people of different communities were able to assist each other during times of adversity. One of the issues relating to the actual design is whether or not each partner will use the same visual template. We want to create an illusion of the experience of visiting peoples� homes, so specific graphics and designs are created by the individual partner that best reflect the sensibility of the community. The key issue is that there must be a thematic continuity to site content. This requires creating a structural template to insure that each partner�s site contains the essential to the creation of contextual links. Our first concern is to make this site as accessible to both visitors and to partner institutions. It is an unfortunate aspect of the non-profit world that not all institutions have the technology or infrastructure to participate in this project. For this reason, we have chosen to begin development with several local institutions that have a basic level of technology, a presence on the web and are enthusiastic about the idea. To keep storage requirements minimal the initial family stories are relatively small, and the contextual links are limited. We also decided to keep the design relatively simple to allow for a greater number of visitors using older browsers and systems. As we develop content, infrastructure and methodology, our stories and links will also grow, as will the introduction of more sophisticated forms of media (video, audio). Plans exist for outreach to other institutions that have entry level technology to assist them with increasing the capabilities of their systems and helping them develop a more solid web presence. Grandfather�s Virtual Kitchen is being built in components. This will optimize the ability to expand the stories as associations with new partner institutions develop. Additionally, discussions have begun about school outreach programs, so those students can research and create their own family stories and links (between schools and other institutions). It is our hope that Grandfather�s Virtual Kitchen will evolve along with technology. In time, there will be web-casts about cultural events and real-time discussions or moderated chat-rooms to share stories and ask questions. We believe that the stories of families and immigrants are a vital component of the American experience. These stories teach real-life lessons about tolerance, understanding and respect that can be applied to communities around the world. Additionally, the method of contextual links and non-linear narrative provides a dynamic mechanism for story telling that makes the user an active participant in exploring. It is not necessary to worry about a virtual grandfather in a virtual kitchen replacing a real grandfather in a real kitchen. It is difficult, if not impossible to replace the spontaneity and vitality of an actual storyteller. But, virtual grandfather can emulate the story-telling experience in a manner that captures the essence of a story and experience. By using the web to tell these stories, the visitor base increases exponentially and the audience expands from the local to the global. The thousands or millions of visitors will share in the journeys through cyberspace while being entertained and educated about the uniqueness of individuals along with the shared experiences of the communities. Lambert, Joe and Mullen, Nina. Memory�s Voices � A Guide to Digital Storytelling. Cookbook and Travelling Companion. (http://www.storycenter.org/cookbook.html). Last updated July 15, 1999 PST, consulted February 14, 2000.